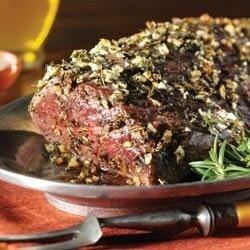 "Beef tenderloin is roasted with fresh thyme and rosemary and served with a zesty horseradish sauce." Heat oven to 350 degrees F. Combine 2 tablespoons of Carapelli, garlic, thyme, rosemary, 1 teaspoon of the salt and pepper; set aside. Heat 1 tablespoon of oil in a large ovenproof skillet over medium-high heat. Add roast; cook 2 to 3 minutes or until well browned. Turn roast over; turn off heat. Spread garlic and herb mixture evenly over top and sides of roast. For that matter, you could spread this mixture on just about anything. Meat. Bread. Veggies. Bacon. Mmmbacon. Transfer skillet to oven; bake 25 to 30 minutes or until internal temperature reaches 125 degrees F. Transfer roast to a carving board; tent with foil and let stand 10 minutes. (Internal temperature will rise to 130 degrees F for medium-rare). Meanwhile, combine remaining 1 tablespoon oil, sour cream, horseradish and remaining 1/2 teaspoon salt; chill until serving time. Carve roast crosswise into 1/2-inch thick slices; place on warmed serving plates. Serve with sauce. Watch your hard work vanish in minutes as family and friends devour. Then bask in the glow of their approval. Good rub, good sauce, and unless you don't like tenderloin, why wouldn't it be 5 stars?